Cooking fish in foil packets in the oven locks in moisture and flavor. Use any vegetables or seasonings you wish, particularly if you already have a favorite recipe. The enclosed packet cooks the fish and vegetables to a soft, moist state. Adding seasonings intensifies the flavor, spreading it throughout both the fish and the vegetables. Most any fish cooks well in foil packets; some options are salmon or white fish, such as halibut. When you remove this dish from the oven, the succulent fish flakes easily and the vegetables are cooked to perfection. 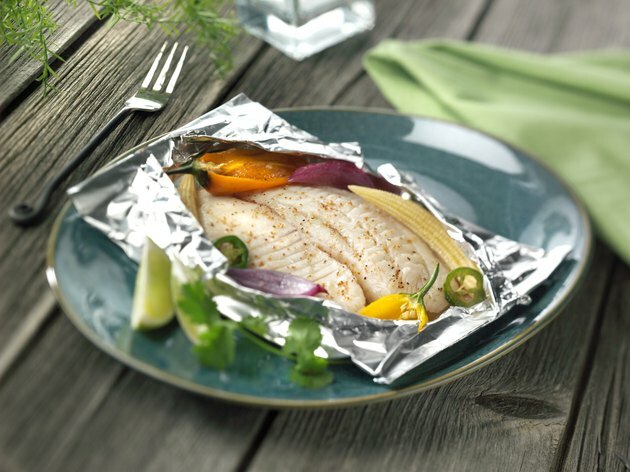 Lay a piece of fish on top of a sheet of foil large enough to completely enclose the fish portion. Add about 1 tbsp. of an oil, such as butter or olive oil, and any chopped vegetables or seasonings you wish to the top of the fish. Suggested seasonings include salt, pepper, oregano and thyme. Include vegetables such as tomatoes, onions, potatoes, spinach and minced garlic. Wrap the foil around the fish piece, sealing it completely closed by crimping the edges together. Set the foil packet on a baking sheet. Allow the fish to cook until for about 20 minutes. It should take about 20 to 25 minutes, but can take up to 1 hour. Cooking times vary by the type and size of fish. Most fish starts to flake when done and changes from a translucent color to an opaque color. Open the packet, slowly and carefully, to view the fish. Be careful, as the escaping steam can cause burns. Flake the thickest part of the fish with the tines of a fork to determine if the fish is done. The flesh should separate easily. Insert a meat thermometer into the thickest part of the fish to verify that it is cooked to a safe temperature. It should read 145 degrees F when the fish is completely cooked. Return the fish to the oven to cook longer if it is not completely cooked through. Serve immediately, after baking, right in the foil packets. Squeeze fresh lemon juice over the fish or place a few slices of lemon in the packet before you seal it.